The Restoration of Radio City Music Hall | John Canning & Co.
Amidst the glitz and glam of the roaring 20’s and early 30’s, tycoon John D. Rockefeller was in the process of constructing a 22 acre commercial complex unlike any the world had ever seen. The 19 commercial buildings constructed were the pinnacle of opulence and success but one building in particular, Radio City Music Hall, surpasses them all. With tens of thousands of square-feet caked in Dutch metal, the building serves as a glittering gem, which optimizes the height of the Art Deco movement. 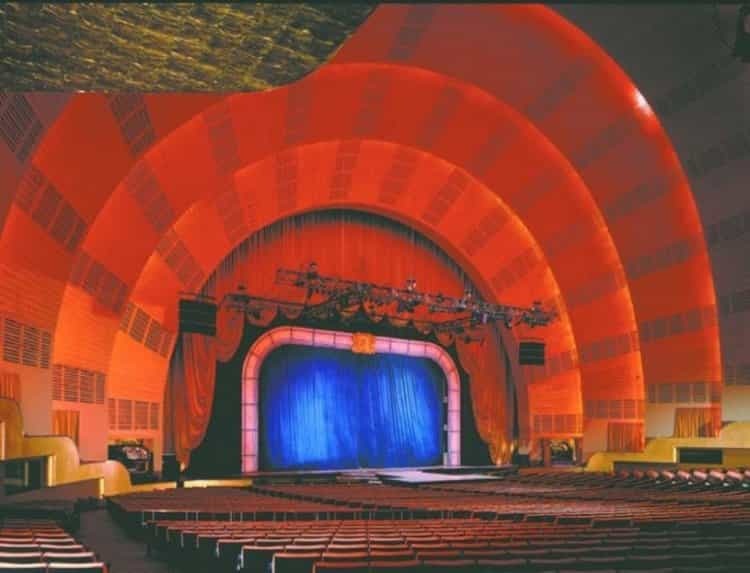 Designed by the famed Donald Deskey, Radio City was intended to be a place so spectacular the only thing that could possibly surpass the brilliance of the design would be the shows themselves. Deskey achieved this vision by covering walls, ceilings and doors in gold, aluminum, and Dutch metal. His designed created a striking imbalance between white and yellow metal, where one was more prominent than the other. The interchangeable use of metal color on numerous surfaces was made even more dramatic by using mirrors and thick curtains in the grand lobby. Copper leaf was also introduced in the men’s lounge, and takes its cues from elsewhere in the building. The dramatic relationship between yellow and white plays out across 90,000 square-feet of gilded surfaces, which might make it the largest gilding project, ever. Each surface required hand application of five inch square metal leafs and then had to be coated with layers of glaze to achieve the final product. Every aspect of Radio City Music Hall was done on a scale so enormous, no other project could possibly eclipse it. In no place is this better illustrated than the grand lobby. Patrons are instantly struck by the curved staircase, which wraps though the lobby without any visible supports. Both the sides and underside of the staircase are gilt in Dutch metal, simulating gold leaf, but there is a specific grid pattern to it. Beyond the shear scope of the project, restoring the gilding on the lobby staircase produced a number of challenges for David Riccio and his team. When it came time to apply the small five inch square pieces of gold, they had to align perfectly. Any deviation to the pattern would be instantly noticeable, ruining the incredible effect. To continue the linear design along the curved portion, each piece of gold leaf had to be cut and applied in a fashion in keeping with the established lines of the space. The effect of the glittering grand staircase is further punctuated with a dramatic, highly stylized landscape scene. Further framing the space are curtains that run from floor to ceiling and mirrors with a gold wash. The theme of gold and white is further displayed in the theater itself. Designed to mimic a sun burst pattern, the stage is elegantly framed in bright tones and vibrantly colored stage curtains. The battle between form and function has no greater resolution than in the coral staircase. Running along the parameter of the concert hall, it is covered entirely in Dutch metal and serves, in part, to further the effect of the sun burst effect Deskey was trying to achieve in the space. However, the coral staircase is just as much an artistic expression as it is an architectural feature, essential to the productions that take place. Completely enveloping the audience, the coral staircase is often where the show begins. Most famously, at the opening of the Christmas Spectacular, the Rockettes dance down the staircase and continue to use it as a means to interact with the audience throughout the show. Perhaps more dramatic than the shows, is the life story of the man charged with producing them. Samuel Lionel Rothafel, or “Roxy” as he was known, was the producer and main visionary, whose foresight, planning, and talent helped to make the productions at Radio city Music Hall beyond all compare. Roxy worked relentlessly to stage the inaugural show. Tragically, he so significantly over-taxed himself, he died opening night. Roxy left an indelible mark, not only in establishing a precedent of magnitude for the shows, but also physically. Tucked away high above the theater is a private apartment not regularly open to the public. In order to thank Roxy for all of his work, Rockefeller build Roxy this stunning apartment, replete with gilded ceilings and hard-crafted furniture. David and his team worked to restore various spaces within the apartment, with special attention paid to restoring the gold gilding on the ceilings of the apartment. The challenges overcome throughout the project were monumental. The scope of the space is unparalleled anywhere but to further put David to the test, the entire restoration needed to be completed in just eleven weeks. Conducting perhaps the largest gilding project ever on just a short timeline was not easy and was again complicated by having to do it in the middle of Midtown Manhattan, where navigating some of the busiest traffic in the world was a daily struggle. Since Radio City Music Hall is a registered landmark, any changes require approval from a board of governors. Fortunately, David and his team were able to develop a productive relationship with the committee overseeing the project, as well as the union overseeing the workers. Through constant problem solving and troubleshooting, David and his team were able to execute one of the largest gilding projects ever attempted and helped preserve one of America’s most iconic landmarks.